Daytrippin’ recently interviewed film producer, Kathy McCabe, to learn more about the new film, Good Ol’ Freda, and its star, Beatles fan club secretary and confidante, Freda Kelly. The film is being released in theaters, on iTunes and VOD this Friday, September 6. 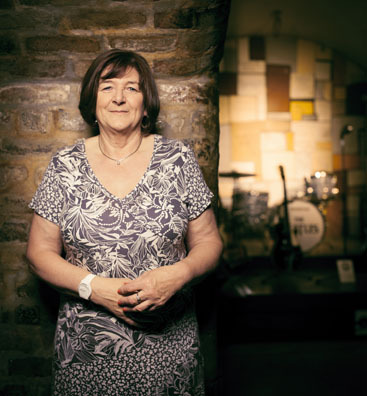 The documentary sheds light on what it was like to be a Beatles fan when The Fab Four played at The Cavern Club in the early ’60s when Freda Kelly first met The Beatles. Kelly says she saw The Beatles play 190 out of the 292 times they performed at The Cavern. Kelly expressed her dedication to the group by running their fan club before Brian Epstein was in the picture. Once Brian signed The Beatles, he asked Freda to be his secretary and her life changed forever. The film follows Freda on her journey working for NEMS during the day and still fulfilling her Beatles fan club duties at night, all the while maintaining a loyal friendship with John, Paul, George, Ringo and their families. 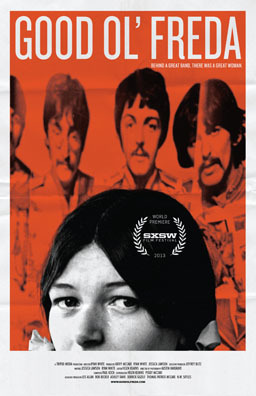 The film captures the warm heart of Freda showing why The Beatles trusted her all those years ago. 1) How did you come up with the idea for Good Ol’ Freda? Are you and the other producers Beatles fans, or was it more about telling a compelling story? Oh yes! I am a huge Beatles fan and was lucky to see them play live twice. Our director and other producers are big Beatles fans too so it’s been a real honor to make this film and preserve some of their history. In 1964, when I was 16 years old, I asked for my name to be put on the pen pal page of the Beatles Monthly Magazine in which Freda wrote a Beatles Fan Club column. It turned out that the sister of the person who picked me as his pen pal worked for Freda at the Beatles Fan Club and her husband was Billy Kinsley of The Merseybeats who appears in the film and played on the same bill as The Beatles many times. It was through Billy that I became friends with Freda. Although we saw each other at parties and concerts, we never talked about The Beatles. She was so private about her years with The Beatles and I had been warned not to bug her with questions!! About 5 years ago though at a family wedding, she told me a few stories that blew me away. I encouraged her to do some private talks at my house in Baltimore Maryland to see how fans liked her ‘little tales.’ Well, a talk that was supposed to be one hour lasted four! These talks gave her confidence to accept an invitation to appear at the Fest for Beatles fans and the reaction of fans there was phenomenal. One standing ovation after another! You can’t fool Beatles fans and they knew Freda was the real thing. Not long after that Ryan White, with whom I’d worked earlier on a film called ‘Pelada,’ became free unexpectedly and ‘the penny dropped’ as Freda says. Ryan, Freda, and I began talking about doing a documentary and in August 2011 we started filming! It became obvious to us right away that this was not going to be a tell-all or a film about The Beatles. Freda’s stories and her own life were so compelling that we knew the film would center on her. 2) Did you approach Freda Kelly or did she approach you? Did she have any hesitation in telling her story after all these years? We kind of mutually approached each other and we were very blessed that she had reached a time in her life where she felt comfortable telling her ‘little stories.’ The big catalyst was the birth of her grandson, Niall. Although she was hesitant, she knew deep down she wanted Niall to understand what she had done in her youth so he would be proud of her. She says in the film she didn’t want him to look over at her in her chair with a cat on her lap and think ‘oh she’s never done anything.’ She’d had many offers over the years to tell her stories but turned them all down. Doing this film was a big leap of faith for her but I think she felt comfortable because she’d known us for a long time so there was trust. She says in the film that if she hadn’t have done this now she knows she would never have done it. If she hadn’t, all those never-heard-before, true stories would have been lost. So we’re very grateful she decided to do the documentary with us. 3) There’s a nice message from Ringo at the end of the film. Have you spoken to Paul McCartney about the film and what was his reaction? Yes, isn’t it a lovely message from Ringo? Obviously from the heart! Sadly, Freda lost her own mother when she was 18 months old. She was so close to Ringo’s Mum Elsie that she considered her a mother figure and her children called her Nanny Else. We’re so thankful to Ringo for recording this message. Paul knows about the film and gave it his hearty approval. 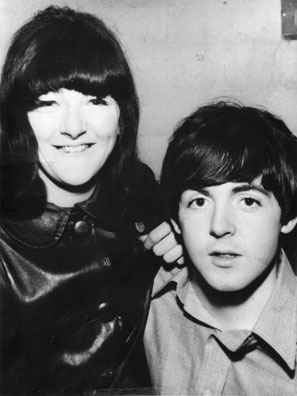 Freda was also very close with Paul’s father who she called Uncle Jim. We worked with Paul’s office to get a message but despite great efforts on both parts the scheduling didn’t come together. 4) I see that you got the rights to four Beatles songs to use in the film (Love Me Do, I Saw Her Standing There, I Feel Fine and I Will). How hard were the negotiations for that? We were delighted to be granted very rare permission to license four Beatles songs as well as the funny music on the very first Beatles Fan Club Christmas Record. That is a true testament of the esteem The Beatles hold for Freda and her devotion to them and their families. We are very proud to have these songs in our film and every time I hear them while watching the film I get goosebumps. The negotiations were long and involved and we received approval just six weeks before our world premiere! One good thing about having Beatles music in your film, it sure helps pave the way for the rest of the soundtrack. We’ve got a killer soundtrack with not only The Beatles but also Buddy Holly, Little Richard, The Marvelettes, The Isley Brothers, Little Richard and Carl Perkins among others. We picked songs that the Beatles loved and had covered in their early days. 5) How did the Kickstarter campaign help your film? Would you have been able to complete it without Kickstarter? We couldn’t have made this film without the generosity of our nearly 700 Kickstarter backers. We had to meet our goal of $50,000 or we wouldn’t have been able to start the film much less complete it. We had an amazing Kickstarter team….a group of friends who worked together for 30 days across all time zones to ensure we met our goal. It was a team effort and Beatles fans came out of the woodwork to help us. We’ll have DVDs in December to send to all our backers. They’ll be the first ones to actually get the DVDs in their hands. We’re working hard on DVD extras right now too so there will be some extra goodies on it! 6) What has the reaction been from people who have seen the film? Do you think this film will appeal to non-Beatles fans? Audiences get emotional when they watch the film We’ve seen grown men cry during it! They’re touched that she gave away all the leftover Beatles memorabilia to fans rather than selling it for millions for herself. She’s still a working secretary after 50 years. Still modest, still shy, still private….people really ‘get’ what she’s all about and in today’s world of 15 minutes of fame, her story really grabs audiences whether they are Beatles fans or not. Freda’s stories are all new and all true and this film presents The Beatles from an angle other films have not…so yes it’s appealing to a wide range of audiences. 7) As a documentary filmmaker, do you have any more music-related films in the works? Good Ol’ Freda is still a full-time job for me!! So I’ll be focusing on this film for the next year or so. 8) Is Freda Kelly happy with the way the film turned out? What does she wish for fans to take away from watching the movie? She’s very happy with it….and she’s even more happy we’ve finished making it!! She’s enjoying meeting fans on the film festival circuit and is astonished that people are interested in her ‘little tales’ as she calls them. Freda wanted to convey to Beatles fans that ‘the lads’ as she calls them were human beings….not gods. So she wanted to humanize them and the experience they went through. She wanted fans to know what it was like for The Beatles and their families in the early days when things were fun and the Beatlemania craziness hadn’t started yet. They were just regular guys from Liverpool who became famous beyond their dreams. But best of all Niall will now know what his grandmother did in her youth! Note: Kathy explained if the movie is not playing in a theater near you, you should call your independent theaters and request it to be screened. The theaters will get in touch with Magnolia Pictures to set up screenings. Categories: Beatles News, Interviews | Tags: beatles, beatles fan club, documentary, freda kelly, good ol' freda | Permalink. I watched this movie last night and it was wonderful. I laughed and cried through the whole film. A fantastic story for Beatles people.